For most students, school is out, but that does not mean learning has to stop. This year the State Park Explorer Program will conduct three “themed” weeks and one special summer long program. Under the clear night’s sky, campers from Warren Dunes State Park gather on the shores of Lake Michigan. Above the stars glisten, below Mike Latus hosts his “Sky Watch” program. “I have several volunteers to help me aim our three telescopes. We often get one hundred people at these programs,” said Latus of his astronomy program. People of all ages have the opportunity to participate in a variety of outdoor learning activities taking place at state parks and recreation areas across Michigan this summer. Topics cover anything from black bears to astronomy and everything in between. 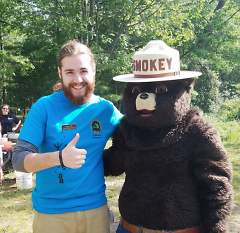 “It’s a great way to get kids involved in experiencing nature in a unique way that doesn’t make them feel like they’re stuck in a science classroom,” said Devin Burke, a five-year veteran explorer guide from Young State Park. 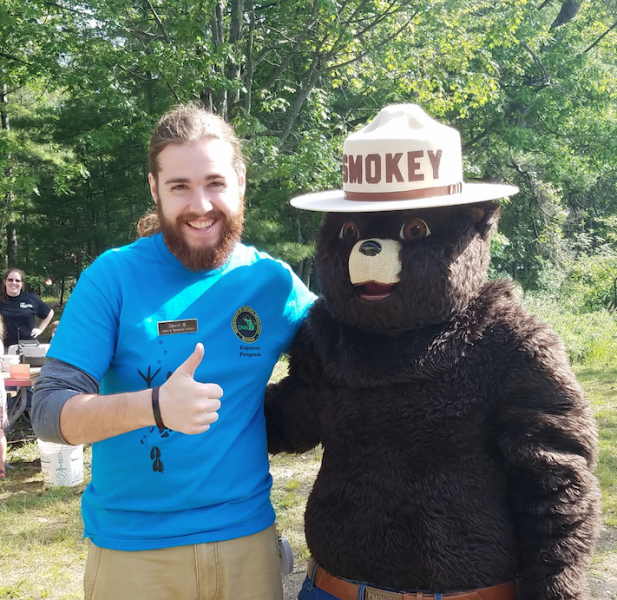 The State Park Explorer Program, headed by the Michigan Department of Natural Resources, was introduced in 2004 to educate and entertain state park visitors through hands-on learning activities. Now more than 40 state parks and recreation areas participate in the program during the summer months. One of the favorites for explorer guides and participants alike is the Hook, Line and Sinker program. This program takes place at over 25 state parks from early June through the month of August. It teaches participants the fundamentals of fishing such as setting up your fishing pole, casting, using bait and removing fish from the hook. Parks can provide a rod and reel, but people are welcome to bring their own. Program participants under 17 do not need a fishing license. This educational program is free with purchase of a Recreation Passport. July 11-17 will mark the fourth annual Michigan Mammals Week. Introduced in July 2013, this was the State Park Explorer Program’s first themed weekend. It will celebrate the great diversity of mammal species that call Michigan home. Feathered Friends Weekend was added this year in June to mark the 100th anniversary of the signing of the Migratory Bird Treaty Act, which provided federal protection for bird species. State parks celebrated by offering bird-themed programs. 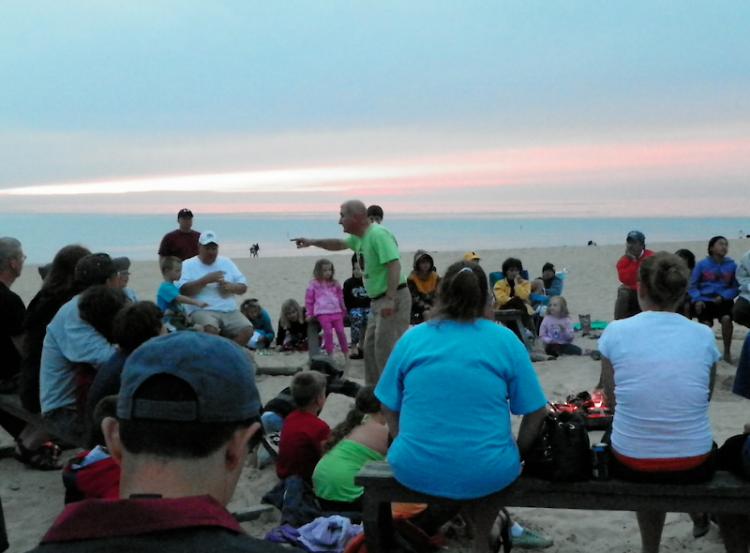 Campers at Warren Dunes State Park, for example, participated by observing birds in their natural habitat. They also learned different birdcalls, bird anatomy and bird behaviors such as migration patterns. Visitors at Young State Park participated in a bird identification activity called “Bird Brained.” Burke created human-sized bird parts especially for the weekend. This gave campers the chance to “become” a bird. Gourlay has been with the Explorer Program since its inception. In 2015, explorer guides offered over 3,800 scheduled programs that were attended by approximately 71,600 participants. In addition, the guides frequently walk the parks, offering educational messages to park guests. An estimated 121,000 people participated in this way. “An average year brings about 3,200 people. Last year was a record breaker. We had over 5,000 people attend programs,” said Latus of participation at Warren Dunes State Park. Latus is a 22-year veteran with Warren Dunes State Park. He began working for the park in 1994 with a program run by the Kalamazoo Nature Center. He remained with the park when it became the State Park Explorer Program. There are 42 explorer guides working at 52 different parks during the summer. They are often from a variety of backgrounds and walks of life. Latus has been a high school math and science teacher for 32 years. This summer, explorer guides range in age from 18 to 70. Many of them are college students, teachers or retirees. The program gives college students the chance to explore potential careers in natural resources or education. For instance, Burke is currently pursuing his bachelor’s degree in education at Saginaw Valley State University. Burke loves seeing people return to his programs year after year. This story is part of an ongoing effort to increase public knowledge about wildlife conservation and the work needed to make sure that we can continue to enjoy the state’s great outdoors for generations to come. The Michigan Wildlife Council invites people to learn more at HereforMiOutdoors.org. 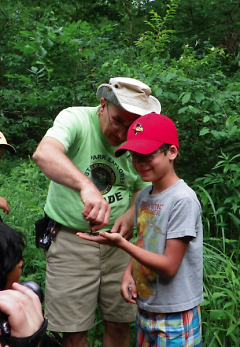 Learn more about the State Park Explorer Program at michigan.gov/natureprograms.